In a short time, Gert De Mangeleer & Joachim Boudens became some of the culinary kings of Belgian gastronomy. The duo transformed an old farmhouse and its surrounding gardens into a beautiful gourmet mecca of international standing. In the high-tech restaurant kitchen – one of the largest in our country – a dedicated team works in silence and utter concentration on the labour-intensive preparations. In those dishes, vegetables, herbs and fruit, are extremely important, most are coming from their own gardens. You can read more about their incredible story on our previous post. Our next visit to this gastronomic temple took place in late September 2016 for a special four-hands dinner. Gert De Mangeleer, a fan of the Japanese cuisine and its cooking techniques himself, invited chef Hiroyasu Kawate of the Japanese restaurant Florilège for this unique event. 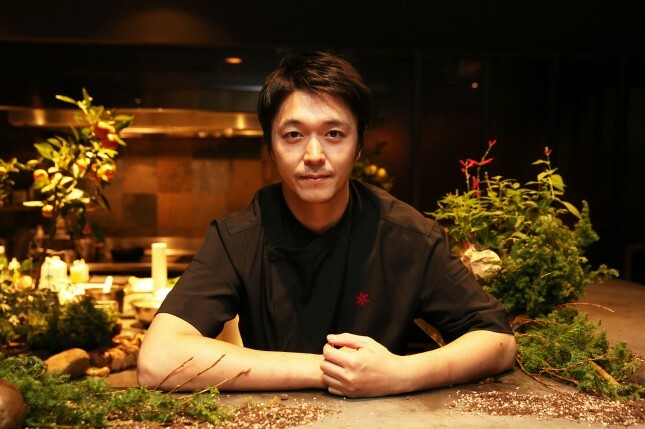 Chef Hiroyasu Kawate started cooking at an early age in the restaurant from his parents. He gained experience in restaurants such as Le Bourguignon in Tokyo and Jardin des Sence in Montpellier. In 2009, he was ready for his own restaurant, Florilège. 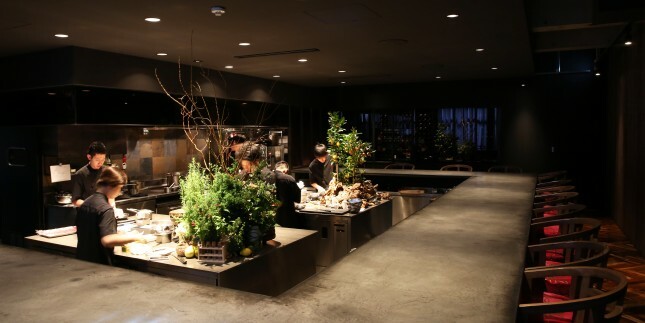 In 2014 the restaurant moved to Jingu-mae in Tokyo and today the guests enjoy their dinner at one large counter. 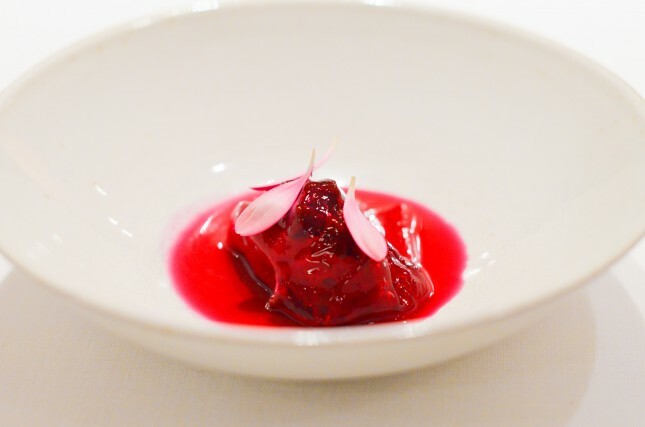 Hiroyasu has a penchant for the French cuisine and combines it with Japanese ingredients and techniques. 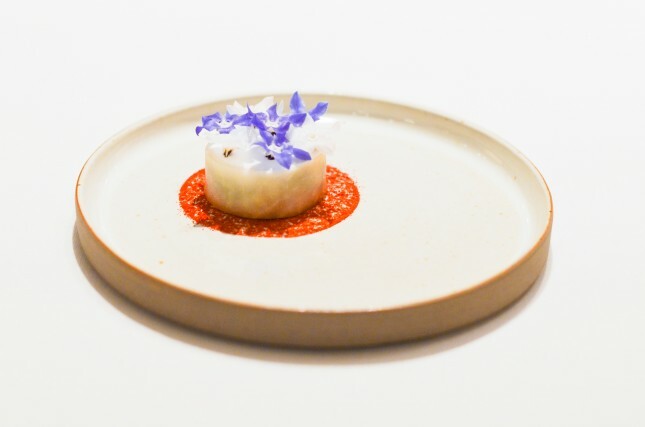 He describes his style as “an innovative French cuisine with local ingredients, in which he brings back the traditional Japanese flavours that characterize Tokyo”. His restaurant was tipped as ‘One to Watch’ in the San Pellegrino’s Asia’s 50 Best Restaurants list. 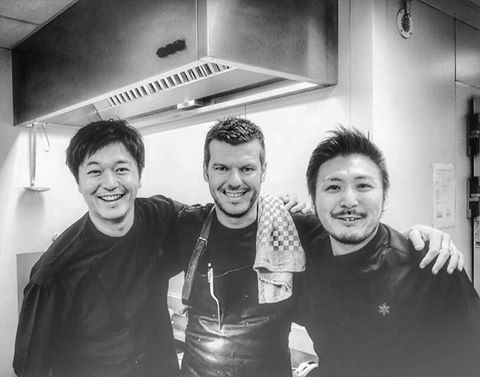 Gert and Hiroyasu have the same taste for a refined, tasteful kitchen and started an exchange project in which both chefs will cook in each other’s restaurants. 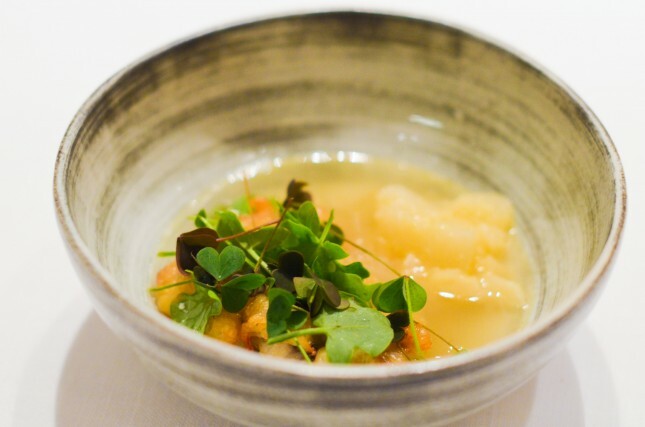 The evening at Hertog Jan was a first try-out where the two chefs prepared 10-course menu, where they both demonstrated the best from their kitchen. Hiroyaso arrived in Belgium a few days earlier to get acquainted with the local ingredients. He creatively combined these in his own dishes and thus brought a beautiful version of the Japanese nouvelle cuisine with a Belgian touch. This fresh starter sets the tone for a lovely evening. Salt Mackerel is perfectly balanced by the creamy cheese, the flower and the peppers give a refreshing touch. 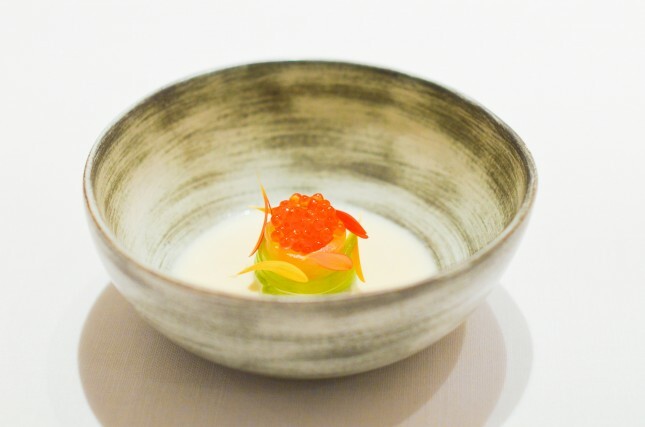 The first bite of the Japanese chef impresses with a nice freshness and pleasant bite with the cucumber and salmon eggs. The sauce of champagne brings depth and provides binding for the other ingredients. We are invited into the kitchen for the next round of bites. 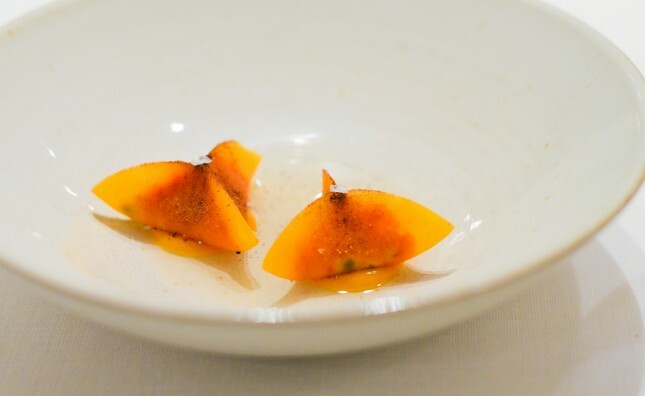 First up is a smoked sweet potato, cooked on the grill and served on traditional Japanese tea leaves. 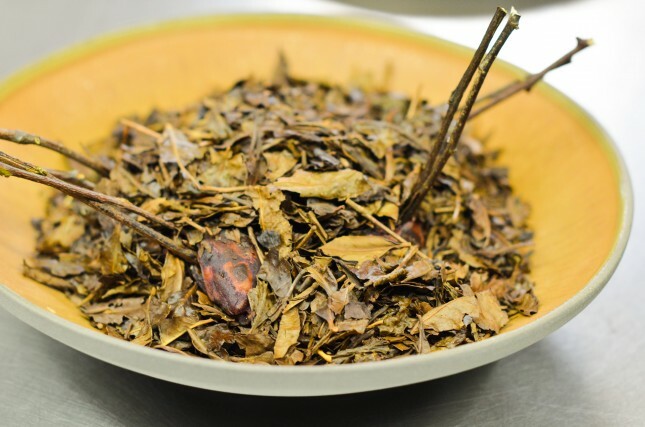 An original, slightly sweet and pleasantly smoked bite. 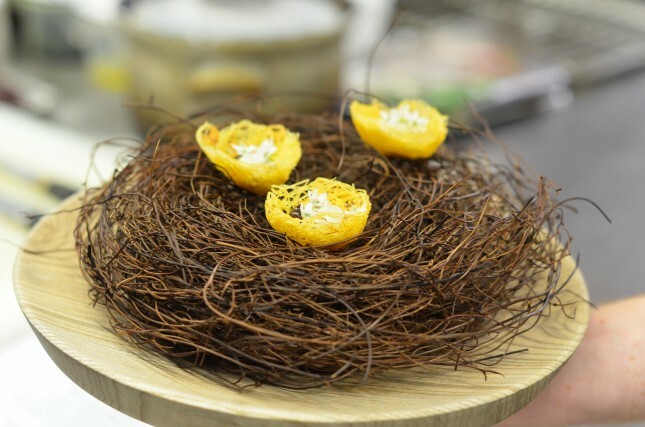 This snack is served on wooden twigs that looks like a bird’s nest. Crispy potato strings bring texture; the miso eggplant provide greasiness. The last bite, and the second of Hertog Jan, is a classic that is loved by many. Merengue of passion fruit, with a core of foie gras, coca cola and liquorice, is a flavour bomb that continues to reverberate for a few minutes. The menu starts with an already legendary course of Hertog Jan. The collection of tomatoes, pick of the day, comes from the more than 136 types of tomatoes from the garden. 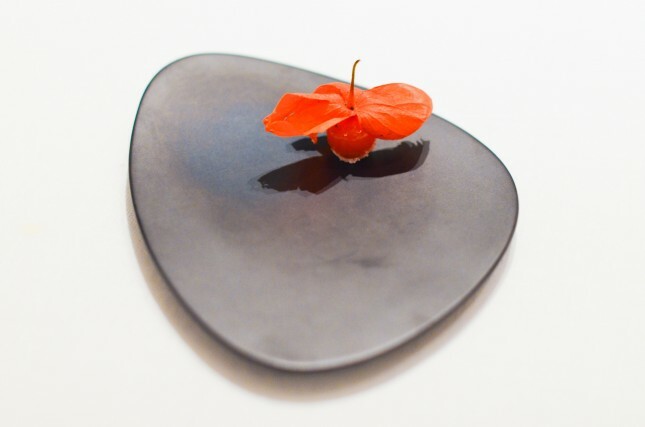 This is a dish that majestically illustrates the philosophy of Hertog Jan, “Simplicity is not simple”. 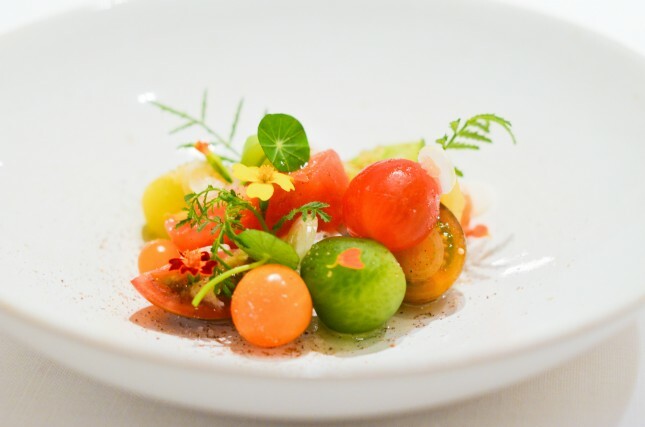 The tomatoes all have different tastes, from sweet to sour, to slightly salty. The ensemble is finished with a fresh gravy, onion, herbs, and flowers. 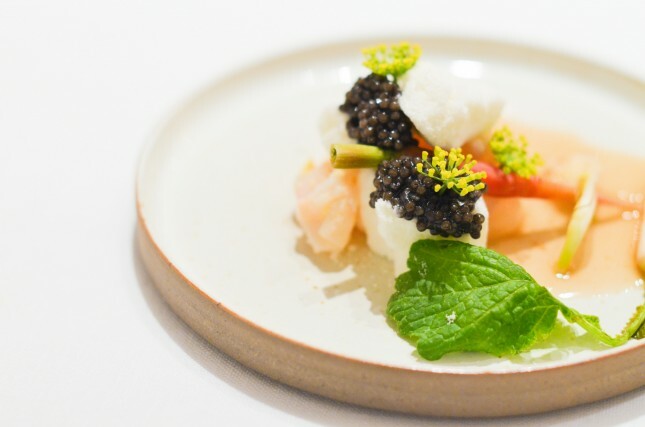 The first course of Florilège is a beautiful preparation of langoustine, crushed between seaweed leaves, combined with goat cheese, koji vegetables (vegetables marinated in the Japanese dashi broth), crunchy radishes and Belgium royal caviar to provide a salty – and Belgian – touch. 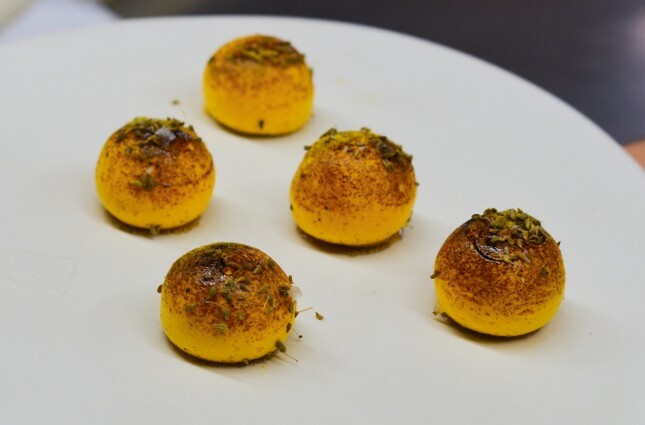 Gert De Mangeleer illustrates his love for Asian cuisine today with a dim sum of pumpkin. 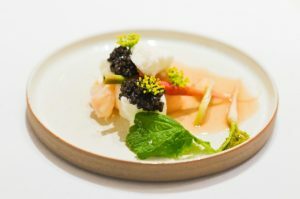 This is filled with juicy langoustine, passion fruit, and a magisterial gravy of langoustine, which continues to fascinate with a deep, rich flavour and pleasant fatty touch. Before the next dish is served, we get a paper that explains the importance of sustainability and waste management for Florilège. A hot topic in the current food culture, and certainly in Japan, but also a trend that gets more and more attention in Europe. 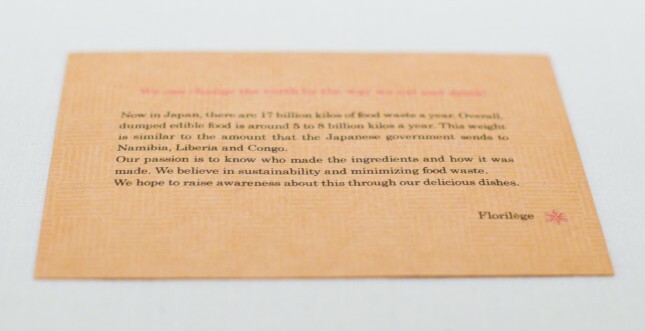 “We can change the world by the way we eat and drink,” we read. Totally agree! 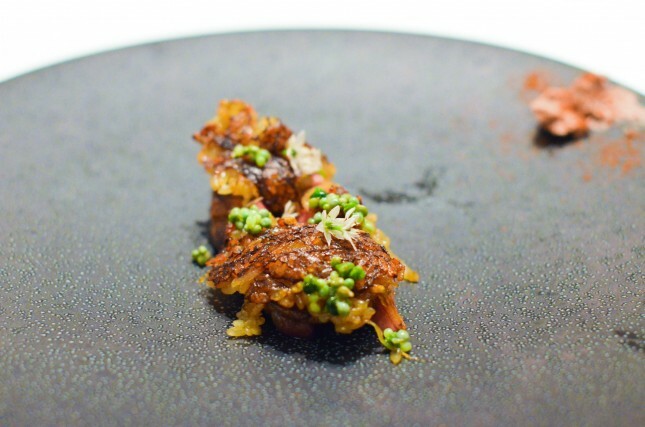 The first meat dish on the menu is a signature dish of chef Hiroyasu Kawate. 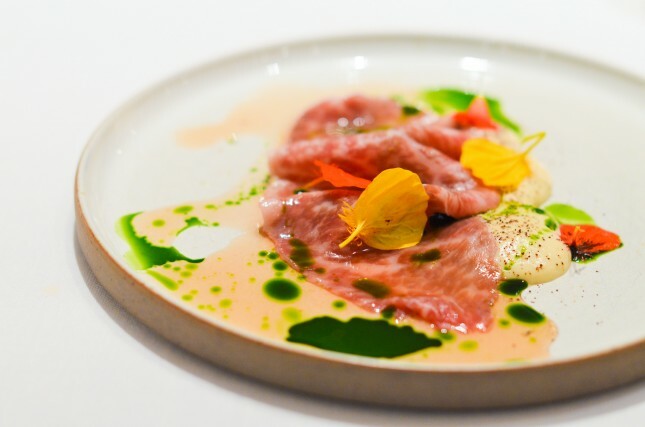 Japanese Wagyu beef carpaccio is served with herbs, puree with vanilla, a tasty consommé of beetroot, and oil with green herbs. Eel on the menu always makes us happy. And especially when it comes into a Japanese version! Hiroyasu serves the eel fried in beer, and cutting bone style: with the small edible bones still in it. The fatness of the eel is balanced by the crispy turnips, green herbs, and fresh sauce of dashi. Just for this dish, an annual visit to Hertog John is a must. Even more, this dish is actually worth the detour every season! 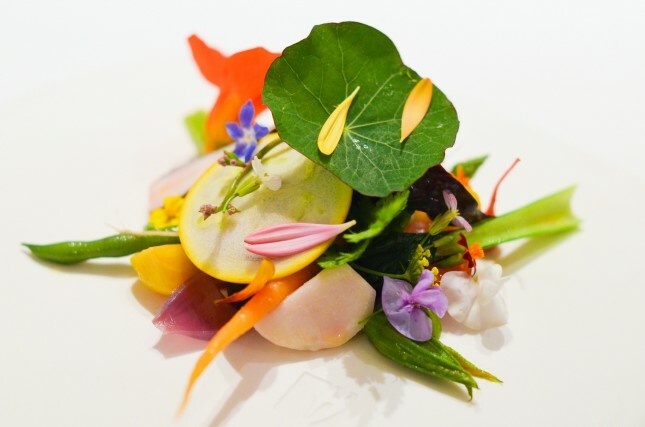 And again a great example of the philosophy “simplicity is not easy.” A plate full of vegetables, each in its own way prepared and seasoned, with colourful flowers, one bitter, the other salty or sweet, and delicious fresh herbs. All fresh produce from the garden. Pure class! The last main course from Florilège is a juicy piece of pigeon. It comes with a risotto of glutinous rice which is cooked long enough so that it is slightly crispy, miso, and a cream of foie for the saltiness. The third preparation with flowers from the garden is another one that makes us happy. 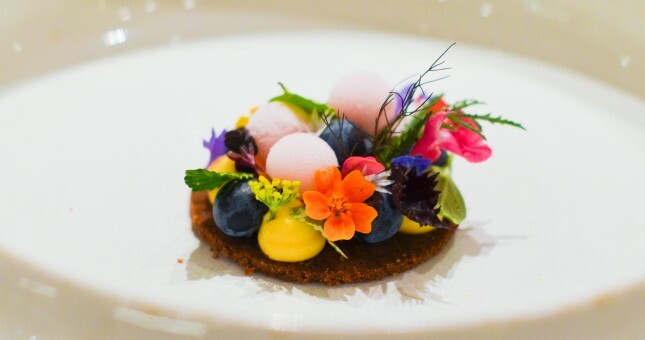 On a delicious cookie we discover a wonderful composition of blueberries, pearls of ice, herbs and flowers. A perfect combination of sweet, spicy and fresh notes. In this dessert Hiroyasu combines the best of Belgium and Japan. A tasty biscuit, creamy chocolate, and Japanese sisho provide a distinctive flavour combination. The presentation of the dish, with a blood-red colour and gelatinous view, is equally striking. The candy trolley instantly puts a smile on the face of our table companions. 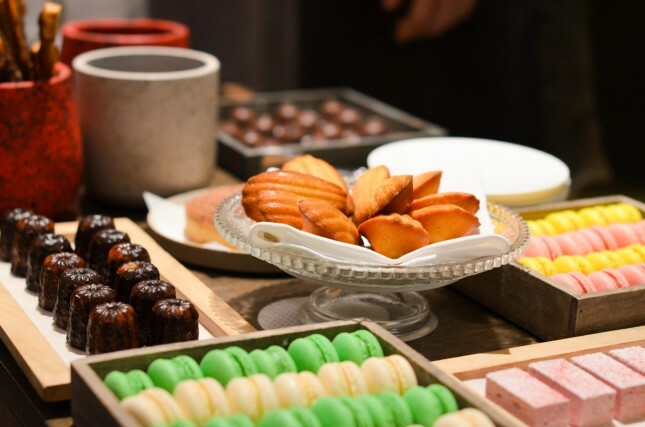 Crispy cinnamon sticks, lukewarm madeleines, fresh macarons… One would try them all! As the icing on the cake, the meal is finished with a beautiful red cherry pineapple. The perfect, fresh-sour ending to a wonderful meal. This 4-mains was a memorable evening which does not only makes us want to plan a visit to Florilège, but also a new visit to Hertog Jan. Thanks Gert, Joachim, Hiroyasu, and the teams Hertog Jan and Florilège!